Einstein could afford to stick out his tongue at the world. He was Albert Einstein! I had just assumed Einstein was always Einstein. Who knew he was a work in progress? Many years later, Thomas’s mother had died and he had become one of the greatest inventors of the century. One day he was looking through old family things that had belonged to his mother. Although the research I have done this week has told me the story is more legend than fact, the story wasn’t entirely false. Thomas Edison was dyslexic, as I was, and teachers back in those days did not know how to deal with dyslexic students. He only lasted a few weeks in public school before his mother, Nancy, pulled him out of school to teach him at home. Of course, people learn the lessons they are going to learn in life. I remember when I was in probably in about second or third grade, I desperately wanted to take ballet lessons. Half the little girls in the world back in those days wanted to be ballerinas, and the other half wanted to ride horses. I never wanted to ride horses. I thought they were sweating poop machines then, and I still think that’s what they are. Anyway, I signed up for ballet lessons, which were held in the afternoons at the Catholic school. The Catholic school was scary enough, because everyone in New Orleans was either Catholic or Protestant, and depending on which flavor you were, you were always told the other group was on the fast track to hell. Just going to the Catholic school for my ballet classes was putting me squarely in the enemy camp. After I’d taken ballet classes for only a few weeks, the teacher was looking for a student to demonstrate a technique in one of the classes and she called me up to the front of the class. She had me demonstrate the technique, but no — that wasn’t enough. I later saw a picture of myself at that age, and I wasn’t ugly at all. I later became ugly. The teacher’s words became a self-fulfilling prophecy. But at the time I was just a regular kid. I could have gone either way. I left that class and never danced again — not ballet, not anything. I became an ugly non-dancer. 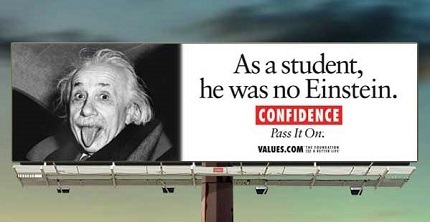 Too bad I didn’t have Einstein’s natural self-confidence. Instead of sticking my tongue at the world, I shut myself up in my shell like a hermit crab. It was only decades later that I realized it wasn’t entirely the teacher’s fault. I chose which words to believe. I could have chosen to believe I had a natural talent for the ballet. Instead I chose to believe I was ugly. Too bad I never told my mother about my experience with the teacher. She may have given me just the pep talk I needed. Mothers are like that. But they aren’t mind readers, and I didn’t say a word, so the pep talk I so desperately needed was never given. Pity. A word of caution to all you people out there who deal with children. You are opening doors to magical realms for the children whose lives you touch, or you are slamming those doors shut forever. Every casual word can inspire or place a mine in a minefield. You never know when you bury those mines when they’ll go off, or whose lives will be scarred forever in the process.